Digital Surrogates from the Traffic Engineering Series, contain study reports concerning traffic signal lights’ characteristics and modules, Uninterruptible Power Supply (UPS) systems and traffic control devices. 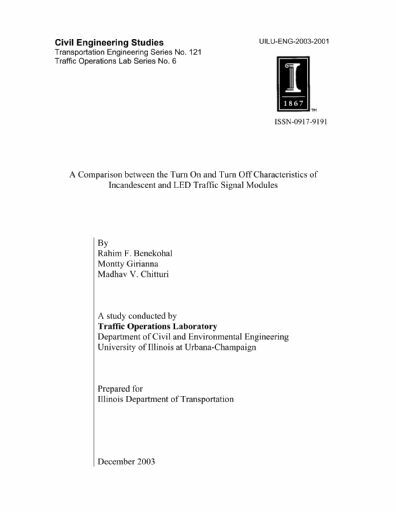 Studies were conducted by the Department of Civil and Environmental Engineering’s Traffic Operations Laboratory, and presented to the Illinois Department of Transportation. The Traffic Engineering Series (Digital Surrogates), 2001-2004 are managed by the University of Illinois Archives and do not feature precise descriptive information for each item. Discover their contents by browsing the folders and files. For more information, contact an archivist at illiarch@illinois.edu.